During the class students will learn various techniques in hand -building with coils or slabs of clay , working with press molds . Additionally, there are all sorts of decorative techniques possible: working with coloured slibs , or rubbing in oxides in textures ,majolica paintings , making textures by using textured cloths etc etc. Henriette has a great collection of examples and she has a lot of experience in giving tips and tricks for your work. The studio is light , spacious and well equipped. There is a clay paste extruder for hollow clay pipes, there are three potters wheels: two electric Shimpo's and one kick wheel and two electric kilns . ​ you can practice during the class or on your own. Everyone works at his or her own project . Experience is not necessary as the approach is very personal . The courses run from September to July. You can start at any level, and enroll in a course if there is space . Missed classes can be made up within 11 weeks. It is also possible to occasionally swap a lesson. € 250,- for 10 classes of 2 ½ hours, including materials and kiln firing. (except very large pieces) A single class is €28,- you pay €140,- and I will only count the times you have attended the class. Valid for 3 month's. To learn throwing on the wheel, it is necessary to have at least 2-3 private lessons, with full attention for 2-3 people , only on the wheel... 1 lesson of 2 hours will be €55,-each. When you can center the clay properly, and pull up the clay without too many problems, you can practice during classes. € 20,- you can work 3 hours at your own ceramics project. You can use all the facilities in the studio, but you buy your own clay and glazes and work on your own. H.C. van Klinken in Amsterdam, with your name and which course. 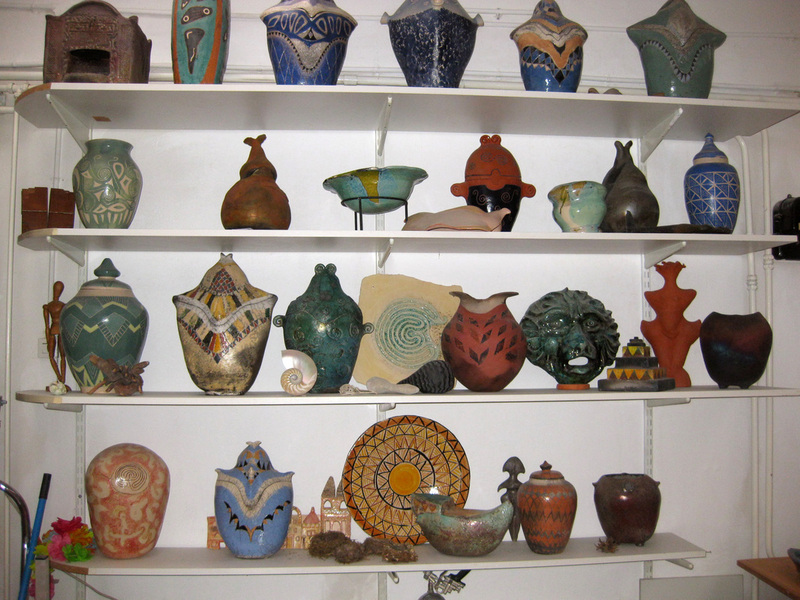 Every summer, a ceramic week is held in guesthouse "La Bouysse"above the River Tarn in southern France. Highly recommended if you want a great, active holiday in a peaceful, natural setting. We work in an outdoor studio and the last day we raku fire our pieces. A small, final exhibition will proudly show our work.. This year the week is planned Saturday 17 / Saturday August 24. In the studio there are bowls, vases, urns and handmade scarves for sale.